Led by the Executive Chef, Kyle Stumpf. The philosophy of using only the finest ingredients brings delicious, world-renowned cuisine. 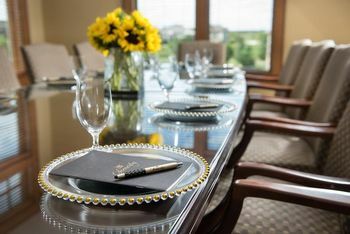 Featuring panoramic views throughout each of the dining rooms, the Clubhouse offers casual dining in the Grille, fine dining in the Chophouse and private events in the ballroom. Adding to the personal touch, the Culinary Team offers cooking demonstrations, wine dinners, and events throughout the year. The professional and dedicated Food & Beverage team will arrange your celebration from an intimate dinner party to an elegant affair. Contact our Director of Event Sales, Trina Leth, to customize and personalize your event. Let's join together and create amazing memories for you and your guests.